For me, if Christmas is about anything, it’s about family and about family traditions. I think it’s how a family keeps Christmas that effectively gives it meaning, creates memories and makes it a special time of year. Christmas was a much simpler affair around the Cheekpoint area 40 years ago. In the first instance limited TV access meant advertisers couldn’t bombard you with the latest action man model with dizzying attachments. Expectations were also tempered because my parents childhood recollections where oranges were considered an exotic present and much sought after. Having experienced the rationing and shortages of the “Emergency” either directly or indirectly had a significant impact on them both. Decorations were generally made from crepe paper and hung from the ceiling in the living room and although the tree had lights, that’s where they were confined to…no flashing snowmen, waving Santa’s, flying reindeer or multi-coloured multifunctioning light displays from off the eves of half the homes in the area. Holly was placed behind all the pictures in the living room, and from an early age it was my brother Robert and I who were expected to gather it. Another job was to make and decorate a candle holder for the living room window into which the largest red candle our mother could find was placed in preparation for Christmas Eve. Central to the festival, was the crib, which was given pride of place top the sideboard in the living room. Although it was a simple enough affair it always drew our attention, but we were warned not to touch it. There seemed to me to be a blatant torture in that, particularly as a child. Of course it was touched, but as the pieces were glued in place, there was little play value in it. My grandmother’s crib in the Russianside was a painting of the crib scene which she stuck to the wallpaper, so no risk of moving any parts there. The one in Faithlegg church was a fine affair, with plaster statuettes of the main characters, some standing almost 3 feet high. In those days it was placed in a manger constructed of timber and evergreen palm leaves with a holly bough atop. Straw lined the base and I think everyone looked forward to the coming of the infant to the empty manger on Christmas morning. As a child I thought making the crib must be a wonderful job, especially as you would get to move the pieces. Matt “Mucha” Doherty was responsible for many of those constructions. In later years there have been several modifications, but I always look back on Matt’s as a classic…but maybe it was just my age. Historically we have St Francis of Assisi to thank for the Christmas Crib apparently. Having travelled to the Holy Land he returned to his Italian homeland and in the village of Grecicco in 1223 re-enacted the story of the “coming of the son” (or should that be Sun) with a life sized model with live creatures and actual people. So taken were those who came to mass at the site that it was continued and within 100 years had spread throughout Italy. I could find no written record of the first Irish crib but did read of its occurrence in England in the mid 17th C. Hard to imagine that the crib was not a feature in Ireland at this point or before. I wonder was it ever a feature within the old Faithlegg Church? The Crib of course, like so much in the church events throughout the year drips with symbolism. I’m not sure at what stage I started to realise not everyone shared the same beliefs, practices or traditions, some major but some just more subtle. The Crib is a good example of this. There was a lovely piece on last Monday’s nationwide of a Capuchin Monk in Dundalk who displays several hundred cribs from around the world over Christmas, all proceeds to charity. Although Christmas has become an over commercialised spending spree at this stage, the Crib still features significantly in our home. My wife Deena won it in the early 1990’s in a Faithlegg National School Christmas draw, made and donated by Jimmy Flynn. The wooden stable was handmade and is a solid 3 sided build with floor and roof. All the pieces within can be moved. Needless to say it was a big draw to our children and Deena not alone allowed them touch it, but encouraged it. Many was the Christmas we hunted for pieces under the tree, down a settee or on one occasion out of the video recorder (Joel’s favourite) . It’s still a major feature of our Christmas traditions, as will be a visit to the Faithlegg Church Crib. Recently I was asked for the origins of the placename Minaun. The Minaun as we wrote about recently is not alone the highest piece of ground in the area, its the highest in the Barony of Gaultier. 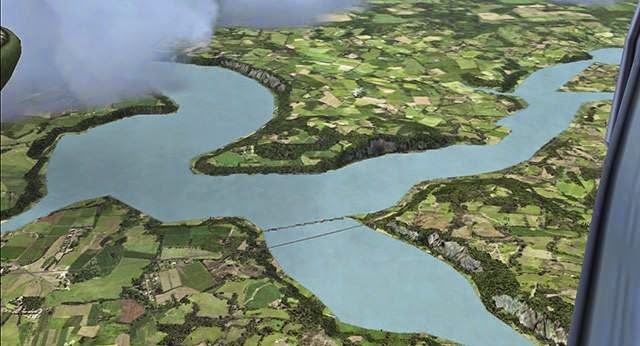 For many years it has been a walking attraction and from its height can be seen the counties of the South East. It also boasts a commanding view of the harbour, the meeting of the three sisters and as far a the Saltee Islands on the Wexford coast. However, despite it’s popularity, when you seek written verification into the placename, there is confusion. According to google, who could argue with google? ?, its a “mountain meadow by a river” or perhaps a “hill of the kids” (goats??). The mountain meadow might refer to the Parcín where generations played hurling and football and is now the residence of the Kelly’s. However, given that the Parcín was below the summit and not as obvious a geographical feature as the pudding stone on top, it seems a fanciful speculation. The reference to goats also has some merit, Anthony Rogers told me recently that there were feral goats running freely around it in the past, but again, I’d imagine that was a more recent (in geographical terms) occurrence and again a fanciful origin. Canon Power in his Placenames of the Decies calls it Meannán Féatlóg or directly translated something akin to the crown shaped hill of Faithlegg. He speculates that the Féatlóg may originate in the Irish for Woodbine – hence the Crown Shaped Hill of Woodbine, or less grandly, the peak of woodbine. Again a bit of a reach. Woodbine is certainly to be found on the Minaun (particularly the eastern side), as it is throughout the area, but you would imagine it would have to be a significant occurrence to deserve such a name. Several years back, I noticed that Minaun is a name shared with another hill, this time facing the Atlantic on Achill Island in Co Mayo. Some reading and googling again proved elusive. One site claimed that it meant a pinnacle (a relationship there with peak). There were also variations on the spelling of the name with Menawn (an attempt at a phonetic explanation surely) and An Mionnán coming up. Only this week, Michael Farrell, who’s a member of the Barony of Gaultier Historical Society, shared a link on facebook about the celtic god of the sea Manannán. Now I know this is a massive leap and totally without foundation, but none the less, I found it intriguing. Manannán was the sea god of the Tuatha dé Danann who offered protection for sea farers, was lord of the weather and of storms and was considered a friend of dreamers. When attacked he would wrap himself in mist to protect his possessions. 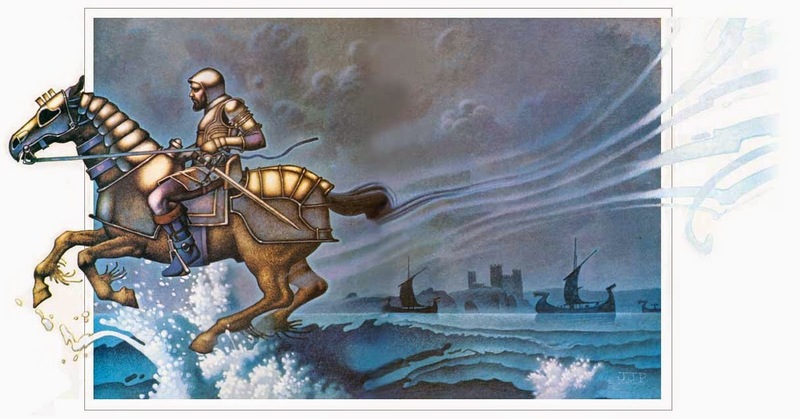 He travelled on his horse Aonbarr, which crossed the waves as if they were solid ground, and upon which he could travel back and forth to Tir na nÓg. Could it be possible that a much earlier name associated with the celts could have come down the ages? It would be hard to imagine that Viking, Norman and English would not have had some impact, but again, even so, very often fragments of an earlier origin remain. I’m also struck by the similarity between Canon Powers spelling and that of Manannán. I suppose against this is that he would have surely spotted such an obvious link if there was one? It’s also pronounced much differently. Whatever the origins, I’ve always been struck by the significance of the location of the Minaun. 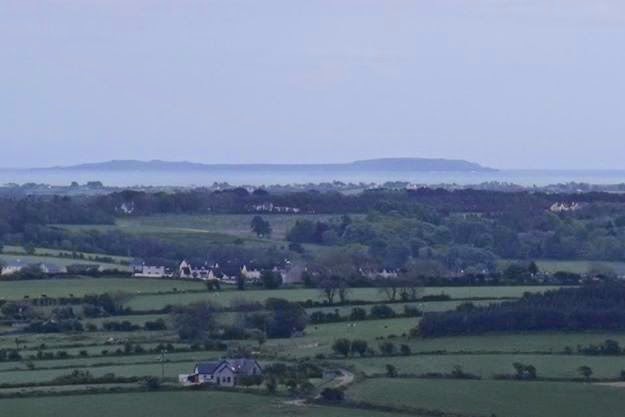 It stands at not just the meeting of the Three Sisters, but also the gateway in Celtic times to the hinterland of the country, the Suir to the Devils Bit in Northern Tipperary, the Barrow to the Sliabh Bloom Mountains. Vital arteries no doubt at a time when transport was by water rather than land. It also has the commanding view of the harbour entrance and, as stated already, offers views of the entire South East. It’s surely possible that the Minaun had a greater role in the lives of others in the distant past, and such a role would surely bring a matching placename? Either way, anytime I stand on the Minaun, I can’t but be taken away by the natural beauty of the place, the magic of being so close to the clouds, the majesty of the view of the harbour, the calm and peace brought by the sound of the breeze through the trees. 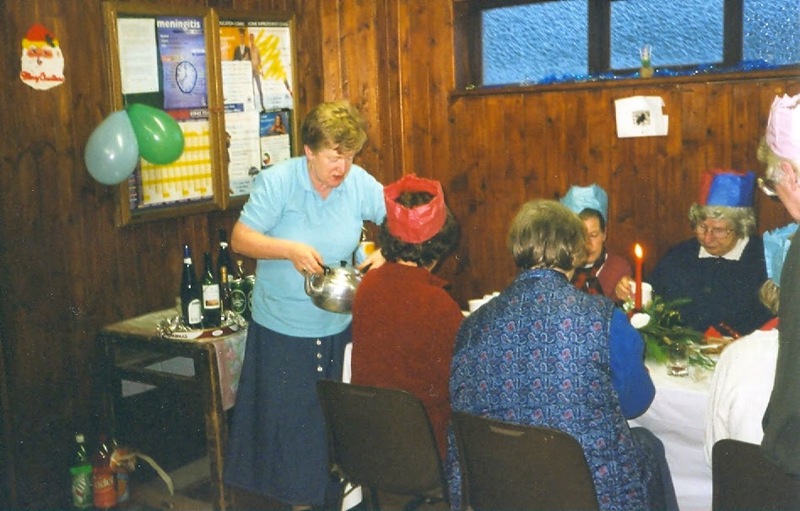 This weekend marks an renewal of an old tradition, the Senior Citizens party. I recall many years back the parties going on in the Reading Room and as youngsters we passed by and could hear the voices and the music and do our best to avoid the cars abandoned on the roadside in the dark. Cars drew up all the time, disembarking patrons to the event and when in full swing more cars drew up, this time filled with steaming pots, boiled potatoes & veg, roast turkey, hams and side dishes. All the food was prepared in local homes and was delivered piping hot and ready to serve. The beer and spirits had been stacked up earlier in the day, and I believe little of it had to be bought as the two pubs in the village went out of their way to provide the liquid refreshments. in Reading Room in the early 2000’s – following much improvements. The hustle and bustle and organisation must have been tremendous as, in those days, the Reading Room was a much more basic building. A small porch at the upperside was the access point. The double doors that are there at present marked the entry to the main hall which as now could be divided into two, and a curtain at the rear screened off the stage. No space then for a kitchen, which would come in time, much less for a toilet, which from a present perspective, must be a bit shocking to realise. It was a few years later that I got my first “taste” of the party, which at that point had moved to the school. Then I was a volunteer member of the local Civil Defence and it was part of our duty to be mobilised into action on the night. Either Gerry Boland or Neil Elliott would drive the ancient ambulance on the night and we would wind our way around the village and off the roads in Faithlegg to collect anyone without a lift. The collection was usually a sober affair, serious chat about the weather, the menu, little snippets of news, the drop home was an all together more fun affair and as a teen I got great mileage out of it. The school provided great comfort in the extra space and convenience of a toilet for patrons. The dance space was probably half as much again. 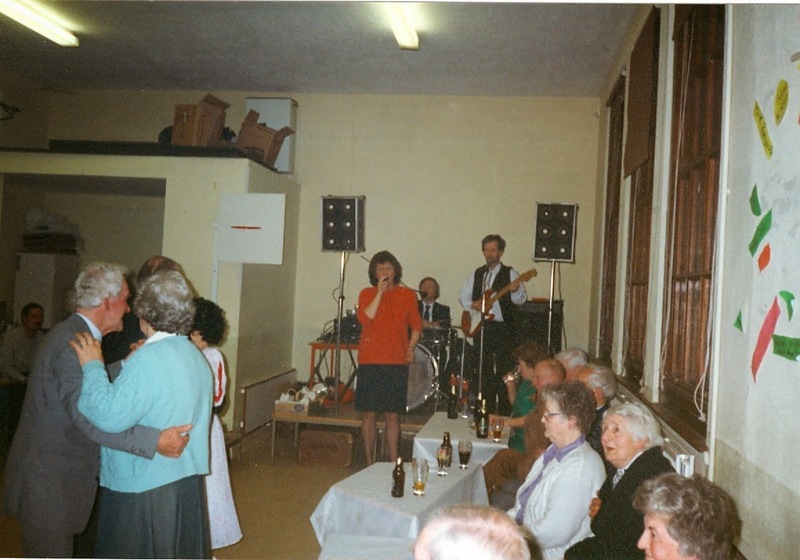 Music was provided from amongst the locality also, Jim Duffin would be eager to perform, but it was Peter Hanlon and band who provided the main act. Singers were much in demand, and it must have been a minefield to Peter to keep the show on the road, and ensure the regular tenors or sopranos got their five minutes of fame. 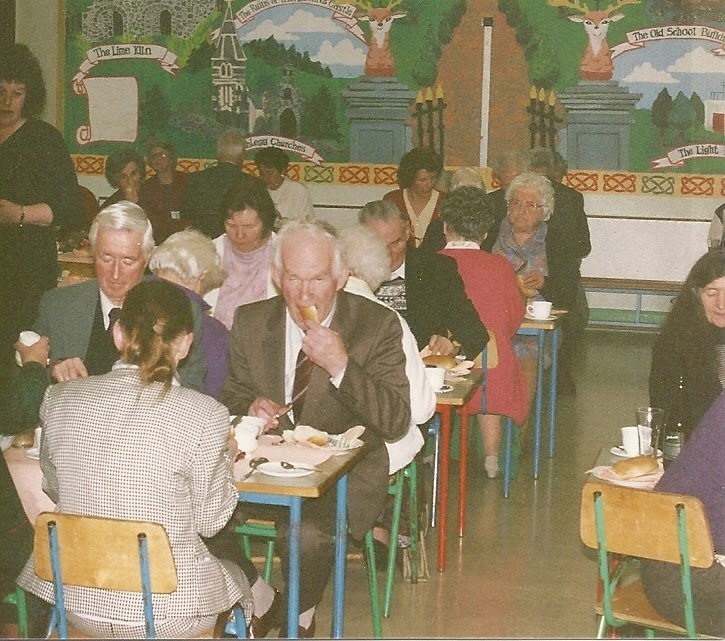 A few years back we pulled together a short video of the events with photographs supplied by Damien McLellan, Tommy Sullivan and Bridget Power. Although we were there to work, and did so including serving, clearing and directing people around the building, we were also there to have a bit of craic. The big draw of the night was a chance to maybe sip a beer. The older men were always encouraging. Tom Ferguson, Ned Hefferenan and Jimmy O Dea amongst others. As a teen, prior to going out to a pub, it was often the first time I heard great yarns, similar to the one I retold about my father at this years heritage week event. There was also dancing to be done, and the women on the night danced with the men, with each other and if need be with us, the helpers. This of course was a cause of mortification, but you were told to grin and bear it, and indeed you did. Although very simple affairs, ran for very little cost and with a maximum of community goodwill the old time Christmas parties were a great affair. Hopefully this years event will match those of the past, either way, we wish all those who are organising and all those who go along, a great night. As a child there was a popular song by Glenn Campbell called Rhinestone Cowboy. Somehow, it wound its way into the local parlance, often sang about the exploits of a certain fisherman who worked Ryan’s shore (or the shore) for a living. It could have been about many at the time, because thirty years ago, Ryan’s shore or, probably more likely known as the Strand now, was a busy place. All the place names on the shore are associated with fishing. The quays, strands, paths, mud banks and even the rocks…the half tide rock jumps to my mind – a way of knowing when the tide on either ebb or flood was at its mid mark. 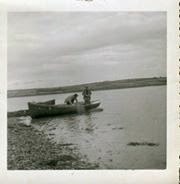 Ebb was most important, as Ryan’s shore was an ebb tide salmon driftnet fishery, the Wexford shore was for the flood. On the days when the wind blew north-westerly the village boats would come down to “trip off” on the shore. It was also a good spot for ground nets in winter and you’d get a good feed of mussels off the rocks. You would be forgiven for thinking that it was all fishermen on the shore. Far from it. In those days it was a mecca for young and old, men and women, fisherfolk and non! For some it was a walk, particularly when the wind blew from the North West, but for many it was for beachcombing. My grandmother (Nanny) spent a lot of time down there and principally this was because it was a good source of timber. Everyone gathered timber in those days and people had their own piles, where they gathered timber to a particular spot, standing it to dry, and easier to come back and collect. As you walked the strand you would stand each piece you wanted. Standing it did two things, drying it obviously but it also denoted that it wasn’t just a piece of driftwood anymore – no, it was now claimed. Driftwood washes up all the time, but it never stands itself up! A stood up piece was claimed and woe betide any one to touch anothers. I remember some fairly fierce rows in the Mount Avenue in days gone by as someone with a pile on their back tried to get past with someone elses timber. If the timber was too big to stand it could be tied. But it had to be tied to a fixed object like a rock or a tree etc. As Nanny grew more frail she gathered “kippings” as she called them; small pieces of driftwood that would kindle the fire for her. These she drew together with a piece of rope and she stood her “bresnees” (phonetically Bres knees) on rocks etc. As a teen I recall spotting the bresnee’s on the strand and realising she was gone over along and raced off to find her. Coming back I gathered the bresnees onto one shoulder and carried them home, all the time she was giving out to me about the weight I was carrying. It was only later I realised how frail she had become, how reliant she was starting to become on others. To her dying days, one of her only regrets was no longer being able to get down to the strand, and even two days before she died, then wheelchair bound, she mentioned it again. But it wasn’t only timber for burning that was important. Many’s the trip I had with a hammer or a screwdriver to collect boat nails or other fittings that washed up attached to floatsam. And there was always tennis balls, sliotars and footballs. Nanny was always lamenting the fact that people trew away such good stuff, all of which she could see a use for. Next day she was having a hot cup soup out of “Lenny” having steeped it over night and scouring it that morning and for years after she was gone from us, I used it myself. It was a sad day when it broke, but at that stage it had given at least twelve years of service. I’ll never know who did cast it, but it was a good lesson to me, part of my grandmothers philosophy on life I guess and learned in a different era. But an era that we can learn a lot from I think. Glued together now, it’s a memento, too fragile to store anything in…but a useful reminder that there’s always something of use to be found on Ryan’s Shore.